Many users want to print their address book, as in the address book that comes up when they click the To button or the Address Book button (Ctrl+Shift+B). This address book is a "virtual folder" displaying a list contacts from all of your address sources and includes only the contacts that contain electronic addresses (email or fax numbers), and does not contain a Print option. If you want to print your address book, you'll need to go to the address source, such as your Contacts folder, then print. You can either use the Print command or Mail Merge to Word. If you want to print only certain contacts, create a custom or filtered view before opening the print dialog or beginning the mail merge. Before selecting File, Print, apply any view except Phone or List if you want to print a Card, Booklet, or Phone Directory. The following methods are marked to indicate whether they are appropriate for the Personal Address Book (PAB), Contacts folders in the Outlook Address Book (OAB) or Microsoft Exchange Server Global Address List (GAL). In many cases, the techniques used for printing can also be adapted to exporting. Use Microsoft Access to link to an Outlook table, and use Access as the report designer. Unfortunately, this method does not support all fields. 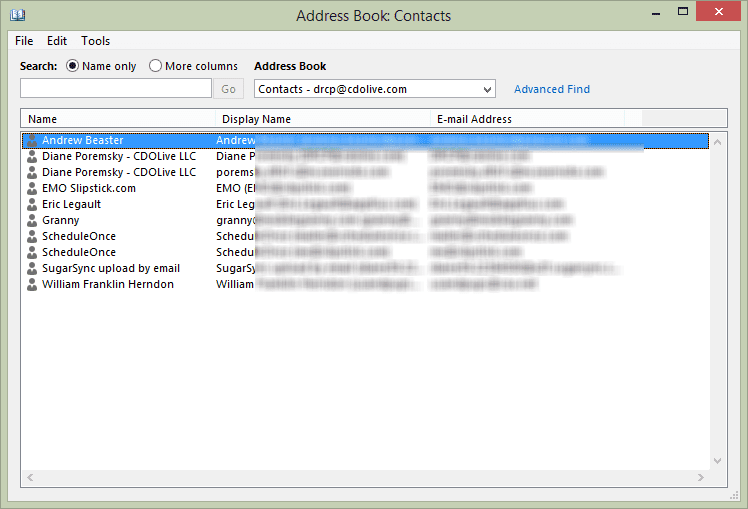 Arrange a Contacts folder view showing the fields you want to print, then print directly from the folder. Use the Address Book as the data source for a mail merge in Microsoft Word, selecting your Contacts folder. The catalog format works well for the merge document. This method will not print details of distribution lists, though, and you'll get only the first e-mail address from a contact item. The main advantage of this method is that you do get the actual e-mail address, not just the display name that the Outlook view shows. Print each Microsoft Outlook distribution list individually. Sue Mosher's book, Microsoft Outlook Programming - Jumpstart for Administrators, Developers, and Power Users, includes a routine to export an Outlook 2000 distribution list to Excel, where you an save it as .csv file. Note: Modern versions of Outlook do not support a Personal Address Book (PAB). If you are still using a PAB, you should import it into your Contacts folder. Import a Personal Address Book into an Outlook Contacts folder and print from there. In Outlook 2000, distribution lists import just fine. In earlier versions, each entry in the distribution list imports as a separate contact item. Import a Personal Address Book into Microsoft Outlook Express, which has a print function. You won't get distribution lists, though. Use the PAB as the data source for a mail merge in Microsoft Word. The catalog format works well for the merge document. This method will not print details of distribution lists, though. Use the Export Client Extension to export distribution lists from a PAB into mail messages. Look for help...I am trying to create a report from contacts in Outlook and transfer to Excel. When I do this it brings my address to another line instead of keeping it in the row. We noticed if we type the address under business address all on one line it won't happen. But, it would be very hard for those in my company to read it easily. I'm sure I'm going to sound like a broken record but there is to many comments to scan through. I have Outlook 2013 and I can't find a CONTACTS or MY CONTACTS anywhere. All I have is the ADDRESS BOOK in the HOME pane. I've combed through every pane and cannot find anything that even hints towards the list. How do I print the CONTACT list? I cannot find it to begin with. Do you see the little people icon (or the word People) at the bottom of the Outlook window? Click it, or press ctrl+3 on your keyboard to open the navigation module were contact folders are stored. In the ‘Business Card’ display on Outlook contacts I have added a photograph of every contact. But when I print the folder the photographs are missing. How can I print the photographs along with all the contact information? you need to print the business cards but outlook doesn't include that format. you can use a macro though. I have one around here somewhere - I'll post it. I am also interested in this information. If you find it, please post. Thanks! I was out of town all week but will try to get a macro up this weekend. Yeah, that would be really nice! I have been searching for more than a hour now for third party software or a marco that does this. But wiith no luck, and I don't know how to write a marco myself. So I hope you'll post it, it would save me a lot of trouble! I'll try and get it up this week. 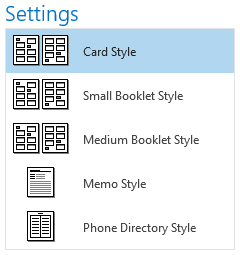 The macro uses contact photo in a mail merge - you'll need to design an address card layout in Word. The macro can also grab the business card and insert it into the word doc. is it possible to print the contacts in address card format and include the photo you have for the contact(s)? Not using the built in printer settings. I'm working on a macro that includes the photos though. In looking at the comments it seems everyone wants to do what I want to do. I just want to print the address book. I have read all the comments and still cannot figure out how to print the address book. Why is this so hard. You would think with all the problems everyone else is having you would come up with an easy way of doing this. why not highlight, right click and select print. Please give me a line by line way of doing this. Some of us are computer challenged. Thank you. The Address book (what you see when you click To or the Address book button) is a collection of your contacts folders and other address sources and isn't printable. You need to print from the contacts folder. I want to create a mailing list for Christmas cards. I created a group and have added contacts. I just want to print a list of the contacts and their mailing addresses. This is probably a simple task but, I can't figure it out. You don't want to use a Contact Group. Add a category to the ones you want to include, group by category and select the Christmas card group then you can do a mail merge to word - either to paper or mailing labels. I have another problem for you. In a previous version of Outlook, I could print contacts for each letter of the alphabet one at a time, but I can't find how to do it with the 2013 version.. This is useful when printing updated contacts without having to print the entire list.